Why is it that "picture time" always becomes "crying time"? It seems like we always want to get a picture right at feeding time, too! 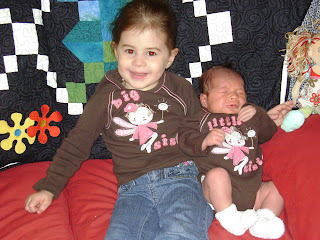 Not sure if you can read the shirts--they say "Big Sister" and "Little Sister." 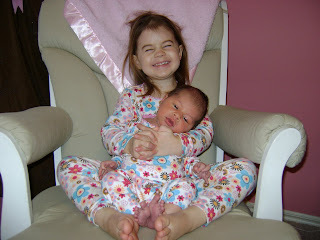 Avery has gotten really goofy with her faces lately--and needs to work on supporting her sister's head! By the end of this photo shoot, Bailey needed her paci! I really thought I had posted these last week, but I guess not. Look at these two cuties! I love them both so much...when you have a second child, you always wonder how are you going to love this one as much as the first. Well, your heart just grows twice as big and you squeeze the other one right in! These girls are so sweet and I pray they will be as close as best friends. 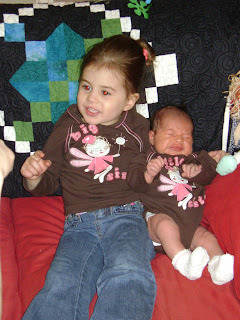 I am already loving dressing them alike, although I think these are two of the only things they have alike. I can't wait to have many more (as my friend Emily says) "matchy-matchy" opportunites! Oooo, I love the matching outfits! On girls it's even cuter! Justin and I were just saying how we wish we could be there to meet Bailey and for the kiddos to hang out. Hopefully we'll head that way sometime this year. Miss you guys! SOOO cute! I'm starting to dream of having a little girl, but a boy would be fine, too! 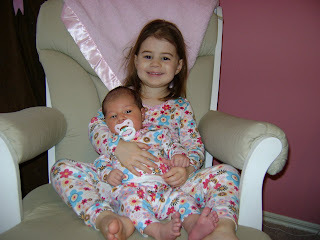 It's just so fun to see Avery and Bailey together and I want Kate to have a sister!